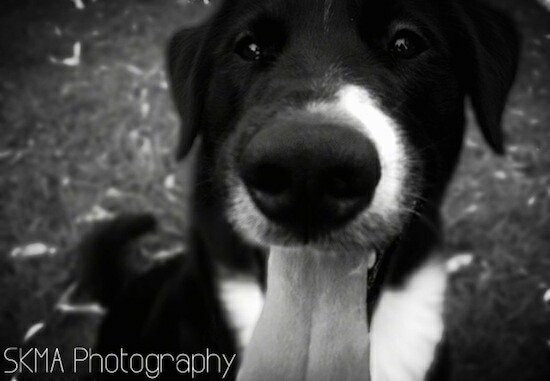 Angus the Labrador Retriever / Dachshund / Northern-sled dog type mix at 3 years old with his owner—"This is the love of my life, Angus. He's been my best friend literally since the moment he was born. We rescued his mom 1 week before she had 6 puppies, the first being this handsome fellow. 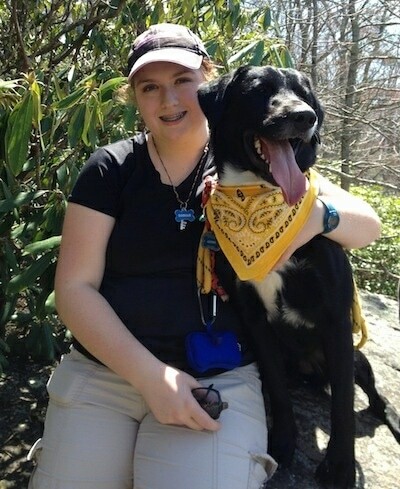 Angus is honestly the best dog I've ever had, despite his many "issues", such as human and dog aggression, mild possessiveness (mostly over me when people he doesn't like or know come near me) and his never ending howling/barking/yodeling/huffing/whining/wheezing and every other noise I had no idea a dog could make. I swear this animal is a human trapped in a dog's body. I began his training at 10 weeks of age. By 12 weeks old he knew sit, down and shake. 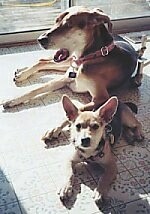 I began formal obedience training at 4 months and by 10 months he was totally off-leash trustworthy. I really worked it into his brain early on that what I say goes and he can't do anything about it. And he really knows this too. Although at 3 years of age, he attempts to test me (what teenager doesn't? ), but he knows that if he does not listen, I'll make him wish he had. Despite me having a tough love relationship with him, I can tell he truly does love me and I absolutely adore him. He's my shadow and I don't know what I would without my boy. He is a very well-mannered canine who loves to work. 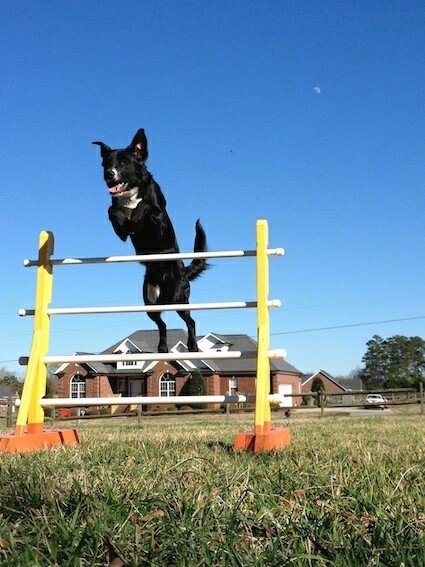 I do obedience and utility jumping with him and he LOVES it. He will go out and jump his utility hurdle without anyone out there. I've watched him. He'll go back and forth, showing off. He's such a clown." 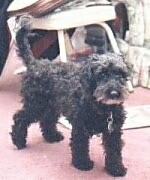 "This is my dog Tucker at 2 years old. 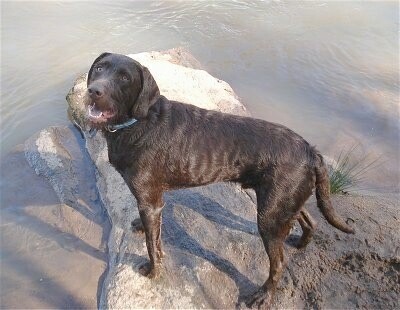 He is a cross between a German Wirehaired Pointer and Chocolate Lab. 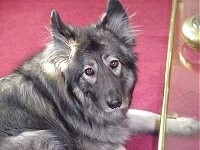 I bought this dog from a friend and I knew both of the parents. They were both beautiful. 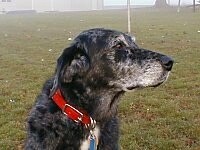 The mother was the Lab and the father was the Wirehaired Pointer. He is all water dog and retriever; he is never happier than with a tennis ball and a lake. 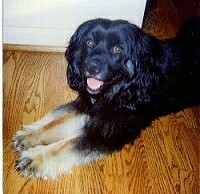 He is extremely friendly and energetic and has never met a stranger. He is also very smart and picks up simple instructions quickly. My girlfriend taught him to shake in an hour with a bag of popcorn. He also points at all birds and strange sounds. I do not hunt but from the pointing I have seen him do and his affinity for water and retrieving I am confident this mix breed would make an accomplished hunter. He is a little smaller than a Lab (80 lbs.) but he is taller. He has solid chocolate wiry hair that wicks water quickly. His coat is more similar to his father’s and he has a beard from his father as well." "This is Chip, because he looks like a chocolate chip cookie. 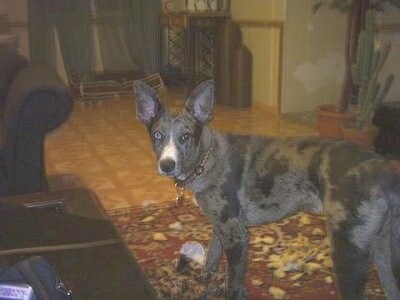 I believe he is part Catahoula Leopard dog with some German Shepherd or Heeler. He was 4 months old when I adopted him from the locale shelter. 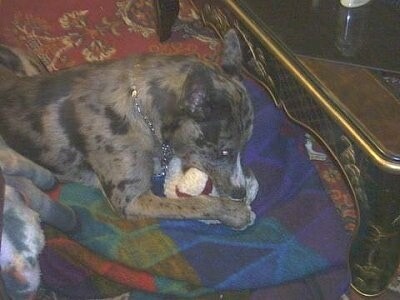 He is almost one year now, but he still nurses on his stuffed baseball." 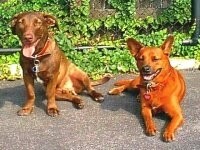 Cinnamon (the red dog) is a Dingo mix and Milo (the brown dog) is a Chocolate Lab / Basset Hound mix.